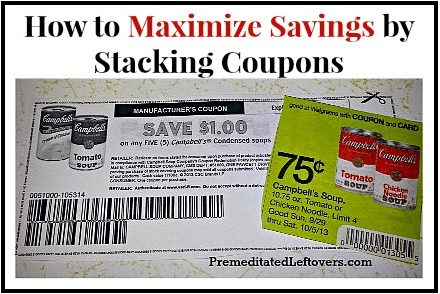 Coupon stacking can bring huge savings on essential items if you know how to do it! 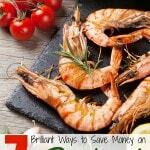 Here's how to maximize your grocery savings by stacking coupons. 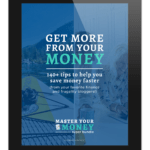 When you are learning to extreme coupon there are many terms you will learn that will be beneficial to your ultimate savings and How To Maximize Savings By Stacking Coupons is one of the most important tools you will learn. 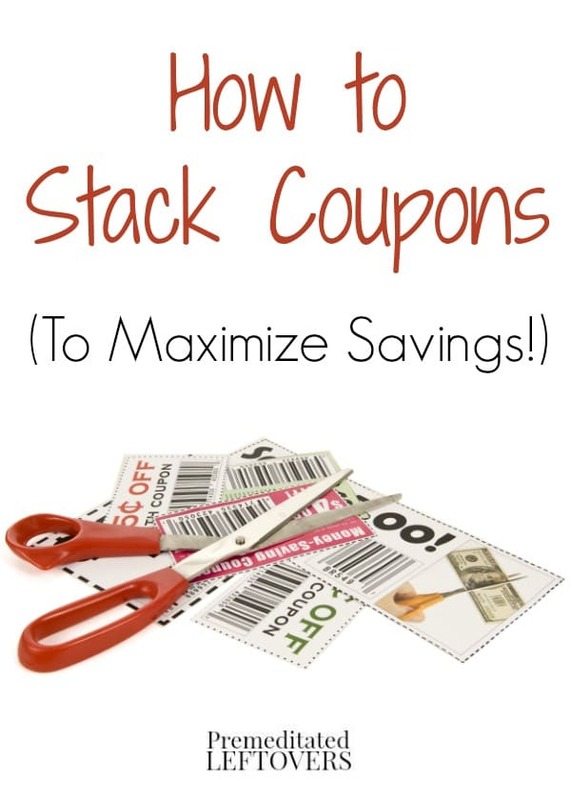 This is a method that is not available at all stores you will shop but learning the common stores that allow coupon stacking will help you know where to find the best savings. 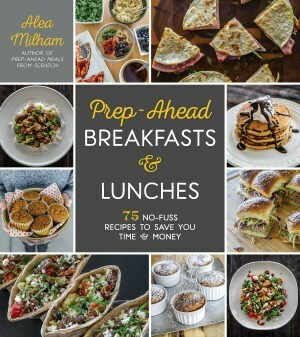 Below are a few tips on how to make this work best for you and your couponing experience. Select stores will allow you to use both a manufacturer’s coupon you have clipped and a store coupon you have clipped on the same item. Where rules typically state one coupon per item purchased, these stores allow you to “stack” making it an exception. The example in the image below shows a manufacturers coupon for Campbell’s Soup for $1.00/5 and a Walgreen’s Coupon that makes each soup only $0.75. When you stack both of these coupons on the purchase of 5 cans of Campbell’s soup it makes them only $0.55 each. 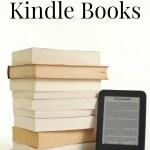 One of the best savings you can find is when you have a store coupon and manufacturer coupon at the same time the store has a great sale price. This is how you often get free products. Diapers, health & beauty items and food at these stores can be cheaper than the stores that double coupons. Many chains allow you to stack coupons and some smaller stores will as well. Below are a few of the more common stores that allow coupon stacking. Make sure to read all of your local chain and small store coupon policies or ask the management for information on their policy prior to planning a shopping trip. Use your smartphone. You can use the Saving Star app to load offers directly to your store's rewards card. Many grocery stores will allow you to load their eCoupons to your rewards card from your phone. Search the Ibotta phone app and the Checkout 51 app to find cashback offers on the items on your grocery list. You can often use these apps in addition to physical brand or store coupon, but in most cases, you cannot use both Ibotta and Checkout 51 on the same item. Always check the store policy ahead of time. This is the most important tip to remember! Make sure the store coupon says STORE coupon on it and is not simply a manufacturer’s coupon printed by the store. Yes, they are different and will have the store logo or “store coupon” printed on it. Check store websites as well as their weekly ads for store coupons. As with any couponing tactic always be fully aware of your individual store policies as well as what the coupon itself states regarding redemption. Follow all guidelines on the number used per day, size, color and quantity required on the coupon. Stacking coupons is often the best way to get free products if you live in an area that does not allow the doubling of coupons. Using the information above and careful planning you will be able to maximize savings by stacking coupons at your favorite stores. What about apps like Checkout 51 and ibotta? The stores in my area don’t double coupons. And, save for a very few, they won’t take internet-generated coupons (not even those from the manufacturers). They all cite fraud as the reason.